Individuals who have completed the mentor application process will be required to attend an initial face-to-face training on the TSBVI campus in Austin, typically during the first week of December. This training lasts for one and a half days, and covers such topics as common problems of novice teachers, mentor/protégé communication, record keeping for mentors, and promising practice standards for TVIs and COMS. This face-to-face training is preceded by online mentor training modules. 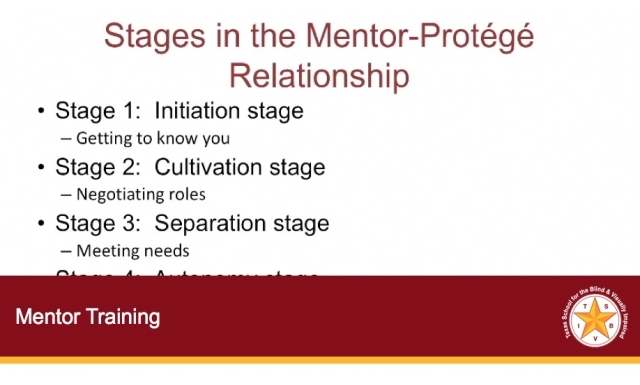 Mentors will also be asked to participate in supplemental training after they have been mentoring for 3 or more years. The 2018 face-to-face portion of Mentor Training will take place on December 7th and 8th. To get more information please contact Chrissy Cowan at . Mentoring a first-year TVI or COMS is both a rewarding and challenging role. Mentor Coordinator, Chrissy Cowan and TSBVI Outreach Director, Cyral Miller, provide valuable insight into the mentor-protégé relationship and offer practical tips on professional communication.